Sporting a new title sponsor – Nolan Fuel Oils of Middleton Stoney near Bicester, Lincolnshire rider Peter Hickman faced some dire weather conditions at Silverstone on Sunday September 26th where he was contesting the penultimate round of the British Superbike championship. But he overcame some technical issues during qualifying and the first race to bring the Ultimate Racing Yamaha R1 home in a fine 10th position in the second outing scoring his best result of the 2010 season. Still forced to use the standard engine borrowed from a stock R1, courtesy of LB Performance at Louth, Hicky was on the back foot at the fast and technical revamped circuit at Silverstone. But he was running within the top 15 in qualifying and poised to put in a fast lap on a new tyre when he encountered a technical problem which caused him to abort the lap and return to the pits. Unable to get back out he found himself down in 22nd place and forced to start race one from a sixth row grid position. With the problem rectified Hicky began the race determined to make up ground and got away to a fine start moving through to 17th place on the second lap. But his progress was thwarted when the red flag halted the race because of rain. Being a small privateer team and not having the manpower of the factory teams Hicky struggled to make the restart after fitting wet weather tyres. As he rode down pit lane the officials shut the gate and he was forced to start from the back of the grid instead of taking up his 17th place. With a lot of work to do he made it through from the seventh row to settle into 20th place but unable to make further progress was disappointed to cross the finish line in 20th, well outside the points. "We seem to be having some problems with the wet set up and then because the restart was tight we missed the pit lane exit by eight seconds so were on the back foot before we started," said Hicky. "Although I passed seven or eight riders on the first lap I was not able to progress further because the tyre went off really quickly because the set up was not quite right." Because of worsening weather conditions and failing light the second race was cut from 14 to 10 laps. 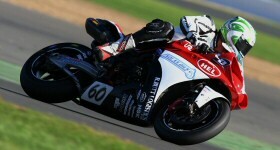 Hicky began from the sixth row and quickly moved through to take up 13th position. He then progressed through to complete the race in a fine 10th position to pick up a further six championship points and his best result of the year. "It's been a bit of a long time coming, we have been aiming for the top 10 all year and it's finally happened. After a poor first race in which we didn't have the settings quite right we worked on it during the break and this time I was able to ride the bike properly. Coming from 24th to 10th is just mega. I had a cracking first lap up to 13th and I am over the moon. I am so happy for the team and my sponsors who have put so much effort and faith in me and it's nice to give them something back. Hopefully we will have the proper engine back for Oulton Park where we have three races and can score three good results to put some more points in the bag." The final showdown of three races is at Oulton Park over the weekend of October 8 – 10 when Peter will be seeking three top results to end his season on a high.